So many VitaMix models. Which one is best? 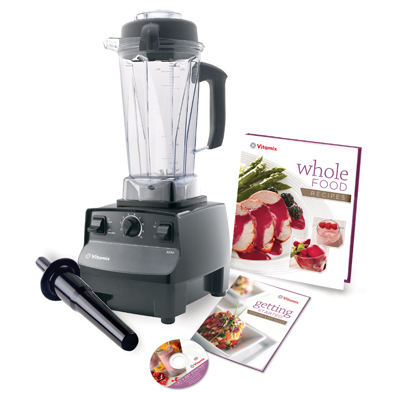 We highly recommend the Vita Mix 5200, but NOT any of the 5000 models, and not the super 5200 or the deluxe 5200. The reason we don’t recommend any of the 5000 models is that the containers contain BPA. The reason we don’t recommend either the super or the deluxe 5200 (which are designed to also grind grain) is because the VitaMix doesn’t grind grain nearly as well as an actual grain mill, like the Nutrimill, so it’s not worth the extra money. Our family used to grind grains in our old Vita Mix, but it really wasn’t able to grind them fine enough to make good bread. If you’d like to be able to grind grains, it’s well worth it to buy two separate machines. The 5200 is just for ‘wet’ blending (in other words, not for grain grinding). This is the model we own, and we love it! It’s BPA free, powerful, and I love all the variable speeds. We use ours at least once a day, usually more, and I’ve never, ever had a problem with it. Ready to buy a VitaMix? Use ‘promotion’ code 06-006117 to get free shipping. *Update from Erin -I just went through the ordering process myself to try it out. FYI – the free shipping isn’t apparent until you get to the end of the checkout process. If you’d prefer, you can order by phone at 1-800-848-2649 using the same code.